Paul and Kiki’s Guide to Vacationing In Italy: Making Your Tuscany Holiday a Treasured Memory is unnlike many travel books as it is written in a very personal narrative style that will help you go through the steps of planning your own itinerary to Italy to your favorite “must see” destinations, along with tips on how to make the most out of your vacation traveling time. And you are given enough information and tips to make up your own unique travel plans or you can just sit back, relax and replicate Paul and Kiki’s easy-to-follow vacation plans in this book. With over 100 beautiful full color photos, Paul and Kiki take you on an Italian vacation through Rome, Tivoli, Naples, Florence, and Pisa. This guide has included all the information you need on where to stay and eat, how to get around, where to shop, where to go and what to see. They also include where not to go (which is very important as you will see when you read this book) and information on what to do and who to contact in case of emergencies. And being seasoned world travelers who have taken a number of guests with them on several trips, they understand the information and important tips that are needed by those people who are not highly familiar with traveling to Italy. Paul and Kiki give you information that you do not want to miss on some of the best deals to look for that will save you money in food and other expenses while on your vacation. We took our friends, Michael and Martha Love, with us on our trip to Italy last year. They are authors of 34 books, writing under the pen name The Silver Elves, and encouraged us to write this book for people like themselves who are not seasoned travelers and could use some assistance in planning their vacations. 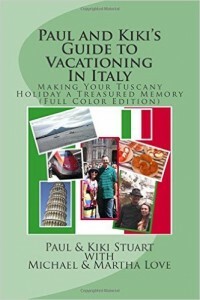 Once we published our book Paul and Kiki’s Guide to Vacationing In Italy and began having so many enthusiastic responses from our readers, we feel even more inspired to share and write a series of travel guide books. The golden rule of travel is that the more you prepare for your trip, the less stress you will have on your vacation. Maybe this does not always turn out to be so due to unexpected events, but we found it to be true for us on our trip to Italy. Since our trip was so much fun, we wanted to share with you how we went about planning for it, and our experience there. We hope this will assist you in making your vacation in Italy a treasured memory. There are so many options for you in your travels to Italy, and our hope is that our book will give you some place to start in making your plans, and that you will find a few valuable nuggets of information contained within it that will make your trip more enjoyable. It is so exciting to be planning a trip to Italy and for many of us it is a lifetime dream coming true. It can also be quite daunting to know where to start in the planning of your journeys, especially if you are new to international travel, and we hope this chapter will give you some insights that lead you in a positive direction for a successful and happy trip. Time is your friend when planning a big trip. Although we have met people who were able to wing it, they are rare. There are people who can get off the plane in Rome, rent a car, and drive all over Italy for three or four weeks. None of us are one of those people. First off, we’re not confident about driving in Italy. We know enough to have noticed that the rules for driving in the northern part of Italy are very different from those in the southern areas. The transition is probably fairly smooth since in the middle of the boot the rules appear pretty much half-and-half. But exactly what those rules are remains a mystery to us. The people we’ve met who drove through Italy either had family in Italy and traveled with them, or spoke Italian and had lived in Italy for several years, so they were already familiar with driving in Italy. For everyone else (like us), it’s probably better to travel by other means. If you travel out of the cities into the country (easy to do by car or train), you’ll find far fewer English speakers. Italians are wonderful communicators, so you’ll probably be able to communicate with a lot of people, and most of the time it will be great fun. But you should make an effort to learn at least a few helpful Italian words, phrases, and numbers, which you need to know for money and for addresses (we’ll cover some of these later in this chapter). It helps to know your limitations, in addition to knowing where you want to go. Your trip will be a lot more fun if you make sure you have the ability, energy, and stamina for your itinerary, and add allowances for any special needs you may have. Wheelchair access in Italy, for example, is not universal — partly because much of Italy pre-dates the invention of the wheelchair. Make sure the places you choose to visit can accommodate you, as well as making sure you are fit enough for your trip. Don’t try to do anything you wouldn’t be able to do at home. If you have any special needs, make sure you allow for them. For example, if you have trouble climbing stairs, you would not have enjoyed our 5th floor apartment we rented in Rome, in spite of its lovely neighborhood and great location. There was no elevator, and a wheelchair ramp — even if it had been possible in a 17th century building — would have been a nightmare for its users. The Internet can be amazingly useful when planning and looking for ideas for your trip. Google can be a great help, as can travel websites like tripadvisor, where you can find ideas for places to visit, sights to see, restaurants, hotels, and things to be aware of or to avoid. Search for things to do in places you’d like to visit. We searched Google and tripadvisor many, many, many times. Google will connect you with a variety of travel resources —websites, blogs, online articles, etc. No matter where you’re going, someone else like you has probably been there. And some of them have written about their experiences. On the other hand, searching travel websites like tripadvisor will let you see questions others have asked, and answers they have received. We found this to be very helpful. If you have special needs, you can use the web to help tailor your trip to your requirements. Others have probably asked some of your questions, and received answers. For example, among our questions were things like ‘what is the best train station to visit Florence’, and ‘closest train station to the Leaning Tower of Pisa’, and ‘how to get from train station to the Leaning Tower of Pisa’. Lots of people visit Italy, and many of them have posted information about it on the web. If you have no idea what you want to do, just search for ‘things to do in Italy’, you’ll get millions of results. Look through the top five or ten and you’re sure to get some ideas. One of the first things that you need to do when planning a trip to Italy is to decide which cities you want to visit. Make a list of what you think to be your ideal cities to visit on your trip. We made up a list of must-see cities and destinations, and a list of additional places to visit we’d like to do if we had enough time. Our must-see list originally included Tivoli, Rome, Milan, Florence, Pisa, Pompeii, and Venice. Our list of additional places included Savona, Sorento, Naples, Palermo, Corsica, and Capri. In addition, you’ll have to decide how you’re going to get from each one to the next. You probably don’t want to drive in Italy. The stories you’ve heard about driving in Italy are true. And there are places you can’t drive to — for instance, on our list Palermo is on the island of Sicily, and Corsica and Capri are both islands. So you’ll want to fly or take the train (or a mixture of both). In Paul’s opinion (having travelled by train in Europe once before), for the full romantic mystique of travel nothing beats the train. But if your time is very short, or the distance between cities is very large, air travel may be a better choice. For this trip, we intended to travel by train within Italy as much as possible. We would fly only if absolutely necessary. To Use the Roma Pass and HOHO or Not? Chapter 9: Who’s Awaiting Your Return at Home?